It's my favourite day of the month - the day of the Counterfeit Kit Challenge Inspiration Kit Reveal - and this time around I'm the Guest Designer. I'm just a little bit excited! This month, we're counterfeiting The August 2012 Kit from Birds Of A Feather and choosing three extra elements from CHA Summer 2012. The first thing that you'll probably notice about my Counterfeit Kit is that it looks nothing like the inspiration kit - and that's a little unusual for me. Normally, I will follow the inspiration kit fairly closely, taking my inspiration from the colours, patterns and embellishments to make up a kit which, if not exactly the same, at least resembles the original. I tried to do that this time around and just ended up with a kit that I knew I would never, ever use. I loved each of the individual pieces, but as a kit, they just weren't inspiring me. So, I knew that I needed a different approach second time around. I looked at each of the elements from the inspiration kit and chose the one that I loved the most - Studio Calico's 'Cubical'. From there, in the same way that I normally approach the full inspiration kit, I worked with the colours and patterns contained with that one piece of patterned paper to build a counterfeit kit that I absolutely adore. And that's one of the best parts of creating your own kits, if it doesn't inspire you, you haven't lost anything. 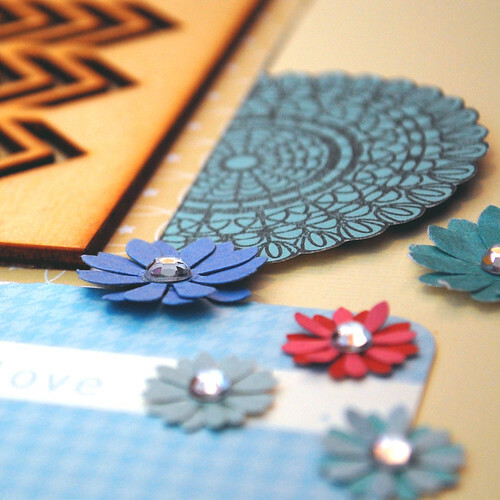 You can put all of your papers and pretty embellishments away and start again if you want to! I've included a lot of embellishments in my kit - or a least a lot for me - taking my cues from the inspiration kit, but giving them a personal twist. I've included baker's twine, but changed the colours to work with my patterned papers and card-stock; the cute wire hangers have been substituted with some heart shaped paper-clips that have been in my stash for too long; and the Maya Road Pennants have been replaced with some Elle's Studio Pennant Labels and dinky, little banner that I handmade using stamps from Lawn Fawn's Bannerific and my trusty sewing machine. I've also added in four different alphas, buttons, beads, a little bit of bling and some pretty journalling cards from a selection of free downloads at Write. Click. Scrapbook. To call my kit complete, I just need to decided on three things that had caught my eye from the latest CHA. Easier said than done, right? I finally narrowed down my wish list to the Plano Cling Stamp by Hero Arts/Studio Calico, which I've substituted with another Hero Arts Doily Stamp that was in my collection; the Heyday Thoughts Stamps from Studio Calico (specifically the uber-cool chevron style arrow) which I've substituted with the amazing Arrows Stencil from Sodalicious; and the cute, little Die-cut & Canvas Flowers from Basic Grey's Serenade Collection which I've handmade using several sizes of paper punches and a little bit of bling. I'll be sharing a tutorial for the flowers (the simplest tutorial of all time!) along with a tutorial on creating your own pennant banner over the next week. I'll make sure that the tutorials appear in the September Mr. Linky, so that you know when to pop back. Now, I don't know about you, but I am dying to find out how the Master Forgers have got along creating their own versions of the inspiration kit (and, of course, I'm looking forward to seeing all of your versions very soon!) Your next stop is the lovely Crystal over at Creations Of My Heart, but you can always return to the Counterfeit Kit Challenge, if you get lost along the way. Go be inspired! 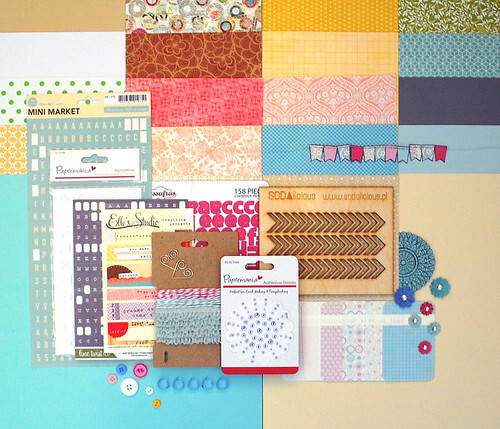 Your kit is gorgeous - thanks for the reminder about Write Click Scrapbook - they are a great resource! Love your home-made flowers - the bling brings them to a whole new level! Oooo....love the little wire hearts. Like you with the first try, I feel like my kit looks hard to work with. It has a very masculine edge. I never thought of abandoning kit and starting from a different angle. Will keep that option open, if I hit a wall. Can't wait to see how you did that tiny banner - I have a great stamp I could use for that :~) Just been thru the hop & am amazed how many different takes there are on this kit. Great thought to make a kit you'll USE - that was a challenge for me this month, too. Have a great month! Beautiful kit-I love that arrow stencil! what a delicious group of papers. I applaud you for altering your kit to suit you! Can't wait to see your tutorials. Have fun this month! Nice! I love the little heart shaped paper clips. I've been looking forward to this - can't wait to see what you do with it! I love the clean elements of your kit! Great take on the original! I built 3 different kits this month before I ended up with my final kit! LOL! You did a fantabulous job customizing this kit so that you will use it! This is a beautiful kit. I love it!! Thanks for visiting. Considering we took inspiration from the same paper we do have such different kits. Washi tape is a fav of mine and i have lots! What a very fresh looking kit! For some reason, it hadn't occurred to me that one option would be to pick one piece of paper and go from there. Might have to try that next time :) Looking forward to seeing what you create with your kit!!! Well done for realizing that the kit wasn't going to work and redoing it. That's a lovely kit and it is important to follow your intuition and do what is right for you. fabulous kit, really like how you put something together that you love and inspires you. Thanks for explaining your process to us, I learnt a lot. Your kit is stunning Clair! I'm so green with envy over the arrow stencil! Beautiful kit, Clair! 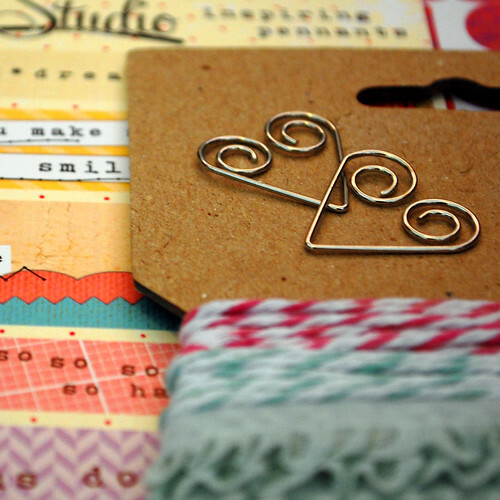 love your heart shape clips and the homemade flowers. I'm so glad you're our GD for this month :).